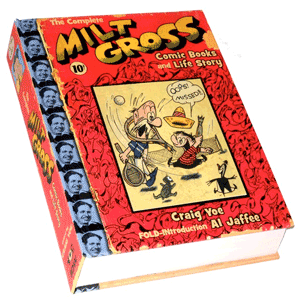 I have been remiss in not showering praise on The Complete Milt Gross Comic Books and Life Story, an amazing new book from IDW edited, written, and designed by my friend Craig Yoe. We may live in an era of so many admirable books reprinting classic comics of the past that it’s hard to keep track of them, but most of Gross’s work has remained inexplicably unseen. 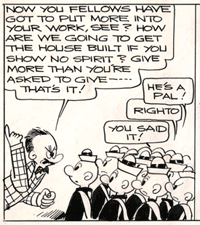 Despite his excellent reputation, very few of his comics have been reprinted, and even less has been written about the man himself. Craig’s book fixes that, with hundreds of pages of Gross’s forgotten comic-book stories and a long, fascinating, lavishly-illustrated biography. If you love Gross, this is a book you’ve been waiting for; if you don’t know him, you need only to skim it to understand what all the fuss is about. Gross’s work is a paradox: It has a rich period feel–1930s Jewish New York–but it’s instantly accessible, too. He was a master of nutty drawings, nutty dialog, and nutty situations. His work radiates the obvious pleasure he took in creating it. I can’t think of any other cartoonist who was funny in more ways. He did some of the best newspaper comics of all time. He was one of the first graphic novelists, and wrote best-selling illustrated prose books. He dabbled in animation (I knew about his MGM cartoons, but was amazed to learn from this book that he also worked on Walt Disney’s Peter Pan). He did movie title cards and billboards and early TV. And, as this volume proves, he was a wonderful comic-book artist. I’ve long owned one or two ACG comics with Gross’s work, but I had no idea that he was so prolific, or so good. These stories–including Gross newspaper staples such as Count Screwloose, That’s My Pop, and Banana Oil as well as new features such as Moronica–rank with some of his best work. Most of these stories are short–five or six pages are common–and they kind of remind me of John Stanley without the deadpan moments and plot exposition–they’re exuberantly silly from the first panel through the last one. Reading them is an intense experience (I recommend small, frequent doses). Craig’s introductory biography is a joy; his design is consistently clever and appropriate; I like the approach to the reproduction of the comics (directly from printed comic books, with the original color). There’s a Fold-Introduction by Al Jaffee, and a Foreword by Milt Gross’s son. And I’m honored to say I helped out a little by contributing the Dave’s Delicatessen original I own (it’s on page 18, although Craig used it elsewhere as well, in a way that delights me). Among the remarkable things about this book is what it doesn’t include: any of Gross’s newspaper work, other than a handful of representative examples such as my original. I hope it’s a hit–once people get their hands on it, I can’t imagine them not clamoring for more Gross books. And there scads of additional examples of his idiosyncratic brilliance that deserve to be rediscovered and enjoyed all over again.